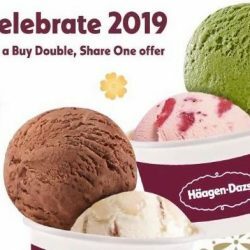 2 - 4 Jan 2019 Häagen-Dazs: Buy 1 Get 1 Double Scoop Ice Cream at All Häagen-Dazs Stores! 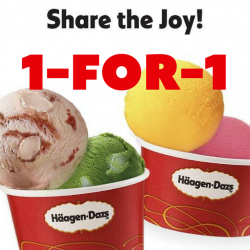 It's a Buy 1 Share 1 Double Scoop Ice Cream promotion for all at Häagen-Dazs! Perfect for family outings and hang-outs with friends. Get yours before the offer ends on 4 Jan 2019! 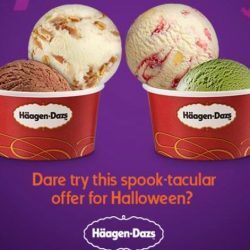 Till 31 Oct 2018 Häagen-Dazs: Buy 1 Double Scoop Ice Cream & Get Another FREE! 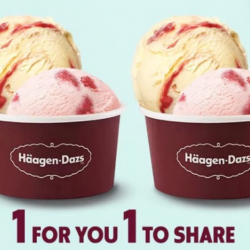 Takeaway a Double Scoop to get another Double Scoop of any flavour free at Häagen-Dazs from now till 31 October 2018! Only at Häagen-Dazs shops. Takeaway a Single Scoop of Plain Frozen Yogurt to get another Single Scoop of any flavour free at Häagen-Dazs shops from now till 14 September 2018! 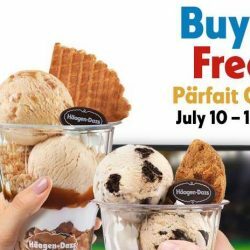 10 - 15 Jul 2018 Häagen-Dazs: Buy 1 Get 1 FREE Parfait Crunch Cup! Nothing brings the world together like the World Cup, topped with great ice cream. 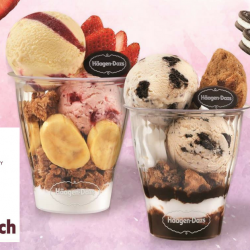 Enjoy 1-for-1 Parfait Crunch Cup at all Häagen-Dazs outlets islandwide from 10 to 15 July 2018! 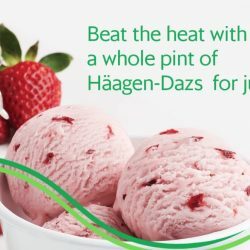 Till 22 Jun 2018 Häagen-Dazs: Buy 1 Get 1 Double Scoop Ice Cream FREE! 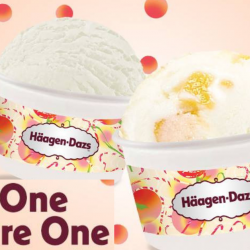 Get ready to pick your favourite Häagen-Dazs ice cream flavour and #LetsPeachParty it up with their new peach flavours because Häagen-Dazs is having a Buy One, Share One promotion! Simply grab a bestie, head on down to any of their outlets and takeaway a double scoop to get another double scoop free! Valid till 22 June 2018. 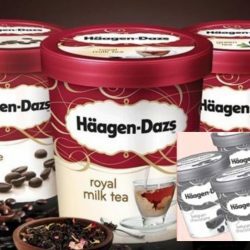 Till 27 Apr 2018 Häagen-Dazs: Buy 1 Share 1 Parfait Crunch! 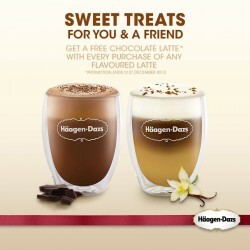 Enjoy a Buy 1 Share 1 Parfait Crunch dessert promo for the sweet tooths out there at Häagen-Dazs! Check in to any of the Häagen-Dazs shops with your bestie and enjoy this sweet, sweet deal from now till 27 April 2018. 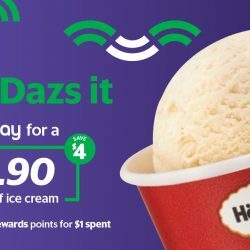 Till 21 Apr 2018 Häagen-Dazs: Buy 1 Get 1 FREE Single Scoop Ice Cream with FavePay! 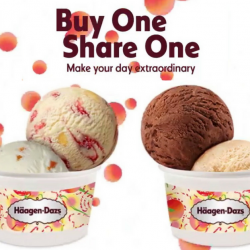 Häagen-Dazs Buy One Share One is happening now! Limited to 1 redemption per user only. The school holidays are almost upon us! 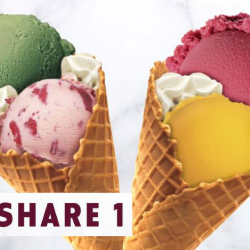 Grab a bestie and get ready to pick your favourite Häagen-Dazs ice cream flavour because they're having a Buy One, Share One promotion! Simply head on down to any of their outlets and takeaway a double scoop to get another double scoop free! 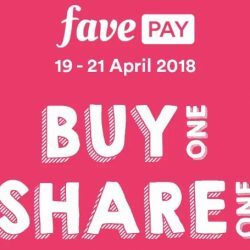 Valid from 12 to 16 March 2018. 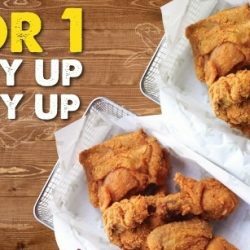 Till 31 Dec 2017 Chicken Up: Enjoy 1-for-1 Crispy Up Mega Half Chicken & Spicy Up Mega Half Chicken! Nothing beats Chicken Up's well-loved Original Fried Chicken Flavors! Giving you more reasons to be merry this holiday season, enjoy 1 for 1 Deals on Crispy Up Mega Half Chicken and Spicy Up Mega Half Chicken! All you need to do is make a reservation via HungryGoWhere here to enjoy this offer! 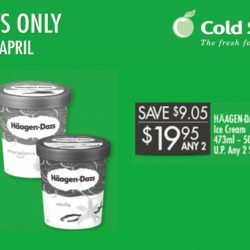 20 - 26 Apr 2017 NTUC FairPrice: 2 Tubs of Häagen-Dazs Ice Cream for $19.85 Only! 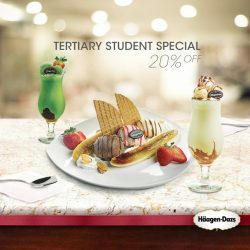 Häagen-Dazs Ice Cream is on promotion again! 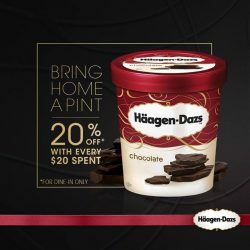 Get 2 tubs of Häagen-Dazs Ice Cream for $19.85 (UP Any 2 $28.90) only at NTUC FairPrice from now till 26 April! That's less than $10 per tub, so grab your favourite flavours now! Have an after-school delight* with us and get 20% off a Banana Split, Seventh Heaven or Frappe when you dine in at any of our stores. Don't forget to bring your classmates along - the more the merrier. 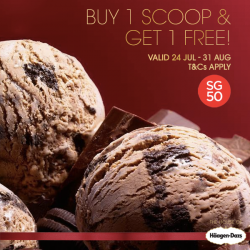 *Valid Mondays to Fridays, 11am - 5.30pm at any Häagen-Dazs store. They think that you deserve a holiday treat so reward yourself with their flavour of the month Strawberry Cheesecake! 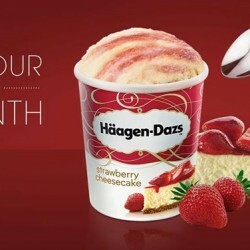 Purchase any 3 pints of Häagen-Dazs ice cream (where 1 pint is Strawberry Cheesecake) at $38! Available at all Häagen-Dazs stores. 3 more days to Mid-Autumn Festival! Have you bought your mooncakes yet? 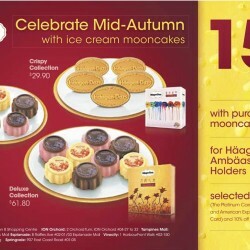 Here's a promotion for Haagen-Dazs mooncakes, enjoy 15% off with purchase of 3 mooncake collections for Haagen-Dazs Ambaasador Card Holders and selected AMEX cards! Now there's more reason to do so. 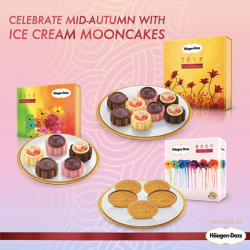 Receive 15% off when you purchase any 3 mooncake collections from Häagen-Dazs stores islandwide. Celebrate mid-autumn with their Deluxe, Petite and Crispy collections that's bound to be a hit amongst your family and friends! Or use your Amex card and get 10% off any purchase! This discount cannot be accumulated on top of existing promotions. Receive 15% off when you purchase any 3 mooncake collections. Or use your Amex card and get 10% off any purchase.